Anybody that uses Windows Explorer will know there’s a few different modes to display files. They can effectively be viewed as lists, detailed lists, tiles or different size icons. When certain image and video files are viewed as icons, instead of a generic file type icon you will see a thumbnail preview image from the content of the file. In the case of a video file the thumbnail will be a still frame taken at random from near the start of the video. Since thumbnails were introduced in Windows XP, support for displaying them has increased with each new Windows release as new video formats become integrated by default. These days Windows 10 can show Matroska (MKV) thumbnails as standard and has better MP4 support although there are still several video formats that no version of Windows supports out of the box. If the format is not supported your thumbnail will just be a standard icon for that file type. If you would like Windows to recognize all the extra video formats that don’t show a thumbnail preview image, the operating system has to be helped to identify what the format is. For that you will need an extra piece of software. Here we show you some dedicated tools and video codec packs that can add thumbnails preview images for dozens of extra video types. Media Preview not just helps you display thumbnails for several video formats but also for a number of image and audio formats as well. Although there’s been no updates since 2014 it still helps fill in the gaps left by Windows. The number of video types it supports is an impressive 46, and includes the 3G Partnership Project, Audio Video Interleaved, Flash Video, Matroska Video, MPEG, Windows Media, RAD Game Tools, Quicktime, RealMedia, Video Object and Ogg Video. During install you can opt out of the image and audio shell extensions if they are not required. 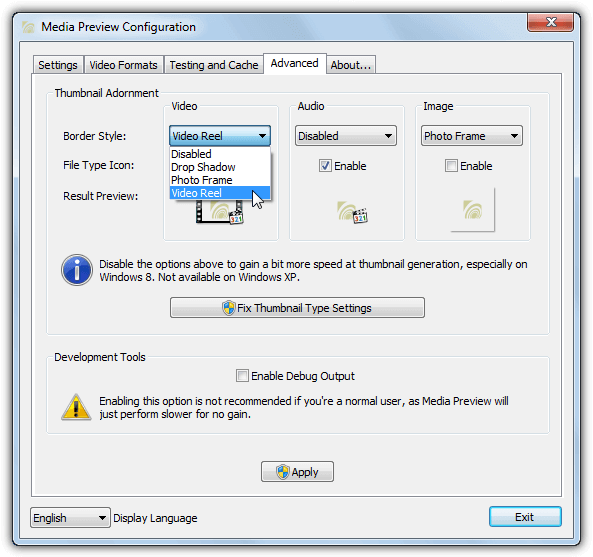 After install the Media Preview Configuration window will popup to allow selecting which formats to include. Simply use Select All if you want to use all supported formats and optionally add custom extensions below. Use the Restore button to reset the system back to default settings. The Settings tab is for choosing the quality of the thumbnail image. For faster thumbnail generation or to help a low end computer, adjust the setting more towards speed. You can also choose to remove the video reel or frame overlays from the thumbnail which helps gain a bit more speed. If overlays are not displaying correctly in all thumbnails use the Fix Thumbnail Type Settings button. Media Preview will automatically try to seek to a suitable frame in the video to display. You can check this and whether the correct thumbnail is shown by the system or stored in the cache by using the Testing and Cache tab. If there’s a discrepancy between the two images the thumbnail cache can be cleared to fix it. The Cached vs Generated option does have a bug displaying the images though. Icaros is a tool similar to Media Preview but is kept more up to date and has a slightly different feature set. 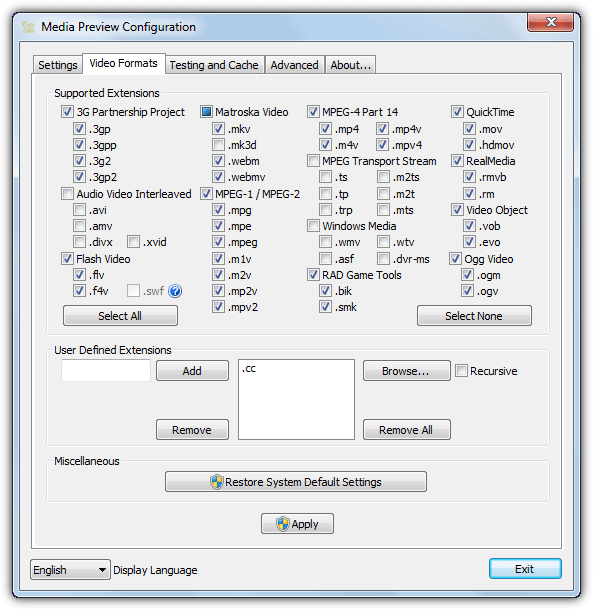 It supports some audio and images in addition to most video formats with around 75 supported file extensions in total. Icaros requires .NET Framework 4 to function which will need to have been installed on Windows 7 and below systems. At the end of the install process you can simply choose to activate Icaros and forget about it although for more complete format support check the option to launch IcarosConfig. Click the preset drop down at the top right and change from Default to Common or Most Known for the program to recognize all the file types it can. Click in the Thumbnail FileTypes box to manually edit or add to the list of extensions. The Thumbnailing window also has a few other useful settings to choose what percentage or time stamp offset of the video to extract the thumbnail, whether to include the media player overlay icon, to include cover art and what to do if a black or white frame is detected. To activate or deactivate thumbnails click on Thumbnailing to the left. 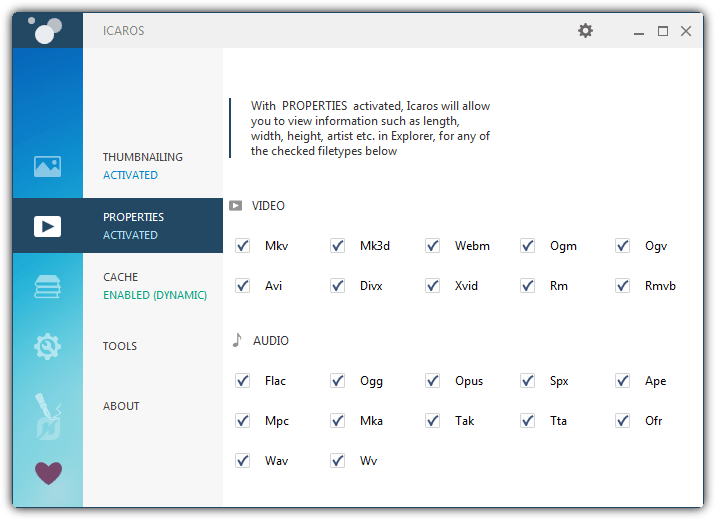 Icaros also includes a properties option that adds extra information for formats not supported by Windows to the Details tab. When you right click a file select Properties > Details. The Caching feature can create a custom cache for predefined folders which gives quicker thumbnail loading while Tools has options to clear the thumbnail cache, refresh/restart Explorer or reset the file types to defaults. Although you can easily install a program above to handle the displaying of thumbnails, it’s also possible to install a complete codec pack to get the same result. Some codec packs don’t support showing video thumbnails out of the box but some do. Here are two that do offer that functionality. K-Lite is probably the most well known and used codec pack available these days and it comes in four different versions, Basic, Standard, Full and Mega. Any version will enable thumbnail support so Basic will be fine if you don’t want extras in the bigger packs. Be wary when installing a K-Lite pack as it offers adware which you need to opt out of or decline. 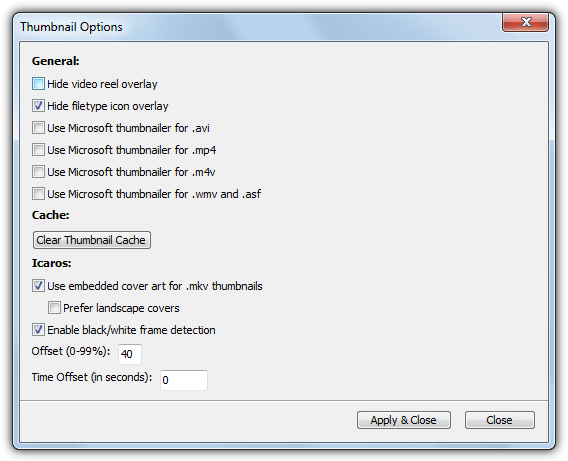 Once installed, open the Codec Tweak Tool and click Thumbnails in the Miscellaneous section. 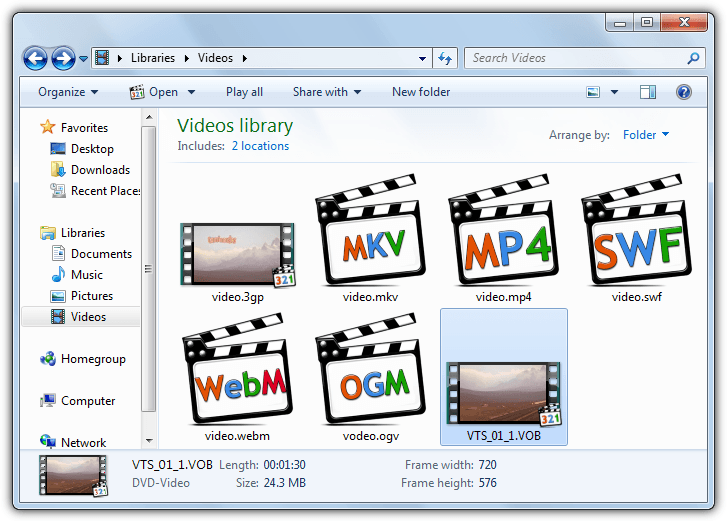 The window offers a selection of video file types that have thumbnail support, click Options to get to the settings. This window offers the ability to remove the video reel and file type overlays, use Microsoft for specific thumbnails, clear the thumbnail cache (via Windows Disk Cleanup), show cover art for thumbnails and specify the time/percentage offset in the video the thumbnail should be taken from. 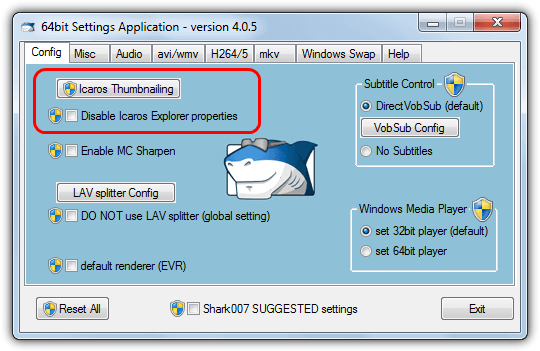 K-Lite and its Codec Tweak Tool use the Icaros libraries to display the thumbnails, the major difference is the configuration UI and the extra features available directly from Icaros. The extra Explorer details for the file types are included as well but cannot be disabled. Do not try to install Icaros and K-Lite/Codec Tweak Tool together as it can cause crashes in the software. The Shark007 Codec pack comes in two flavors, Standard and Advanced. These packs are a lot bigger than K-Lite and are around 41MB for Standard and 62MB for Advanced. The ability to show thumbnails for video files is included in both so for that either version works the same. Like K-Lite, the Shark007 Codecs also use Icaros to show the thumbnails. Although in this case the whole Icaros package is included along with its normal user interface and options for video file details and caching. Thumbnailing and Properties are pre-enabled along with several file types. To open the Icaros user interface or quickly turn off detail Properties open the 32-bit or 64-bit settings application depending on your system and look on the Config tab. And what has that got to do with displaying thumbnails for unsupported video formats?? MediaPreview is a beast! Icaros was NOT getting it done. Uninstalled Icaros, MediaPreview even fixed my ts files…. This actually worked very well. I was having an issue where all my OBS recordings would just show a VLC icon and Media Preview solved it! Wow, I just had to add webp extension to MediaPreview and it works for webp images too! I’ve just downloaded and installed Icaros using the provided link and it offered nothing and installed nothing apart from the program itself. Care to elaborate on what “things” were attached to your copy? The whole purpose of these types of program is to cache thumbnails and icons to load fast. There is a problem I don’t see being addressed. Just about everything besides videos and pictures have icons. Game icons, program icons, you name it. These are the areas I would love to see being integrated into these programs. Try creating some folders with nothing but game and program shortcuts in them. Each day loading those folders, it take from 30 secs to a minute to load all the icons. Even in the same day is you have these folders closed for a period of time, and open them again, that same process starts all over again. I don’t understand why all those icons can’t also be cached for instant retrieval like video files are. It just can’t be that big of a deal to make this happen or no one has figured out a way yet. Microsoft sure hasn’t. Doesn’t make sense in this day and age of fast computers the we still have this kind of stuff happening. I seriously never leave comments in these types of places after getting/testing/using what I need, be the thing successful or not but I feel inclined to do so this time because not only did this work great, it really and utterly was flawless. I’m sort of technologically impaired even compared to most, even. I was having a problem with my video/picture thumbnails not showing and instead, displaying the icon for the media player (VLC in my case) and after visiting a dozen websites with conflicting answers and no resolutions. After trying command prompts and other programs I finally happened upon this one thankfully. I downloaded it (no ads or extra installs hidden in the download) opened it (well, it launched by itself in a matter of seconds) I ‘added a file type’ (just opened a single one of my videos) and booya’. Problem fixed. I repeat, I never leave comments in these places, but I was so utterly impressed and happy that I even decided to turn off my adblocker and send a donation, which; sort of Wikipedia, I never do. Thank you so much. Media Preview did the trick on Windows 10!! Thank you!!! I use “Media Preview”. The program works great! Thank you very much for your help! Good, not great. Catch is, aside from incomplete format coverage and spotty performance, is that it preview size is capped, and small, sigh. It’d be a great utility if it offered zoom/full-preview-window-coverage. This tool is awesome! Easy to use and efficient! I spent much time without success trying to make my laptop to show previews of AVI files instead of a standard icon. With Media Preview it is done in one click! Thank you! for essentially any video media type supported by LAV Source Splitter.” It comes bundled with K-Lite codec pack and also separately.